InfiSecure specializes in protecting Web & API from OWASP Top Automated Threats such as Web Scraping, Content Theft, Account Takeover, etc. 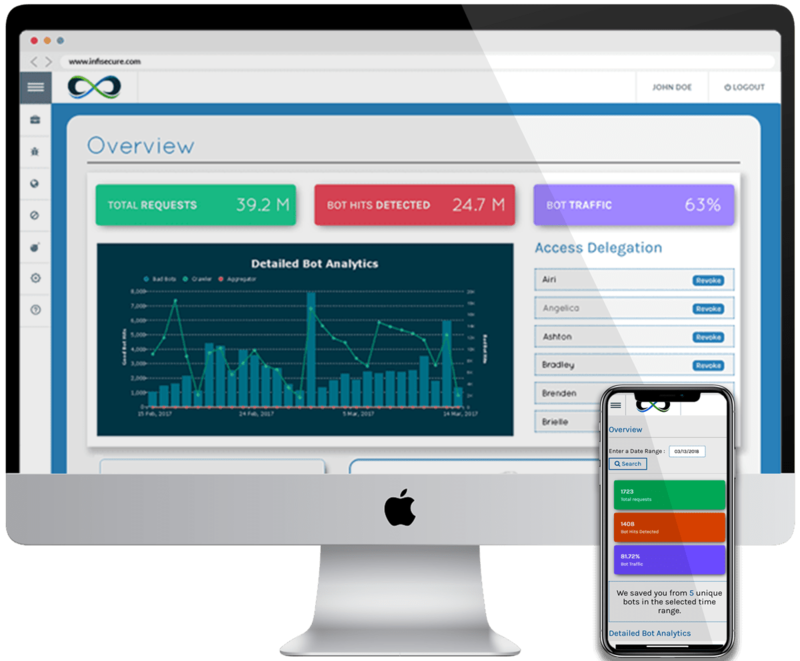 Our Anti-Bot solution empowers your IT, Legal and Marketing departments to efficiently manage and protect your domain names, trademarks, products and online brand identity by allowing you to detect and mitigate against all malicious automated traffic in real-time. With our ready integration kits and plugins, get started with active protection within 15 minutes. Get 1:1 dedicated support during integration. Personalized dashboards for real-time traffic statistics reaching your server. Get complete details of all bot traffic with features to block and unblock individual bots in realtime. Blacklist and Whitelist IPs, useragents, countries, domains and set advanced preferences for real-time bot detection to suit your needs. Dedicated account manager and technical support team to take care of your website when it is most needed. It only takes 30 minutes to find out how InfiSecure's Bot Mitigation can help you block all automated threats.